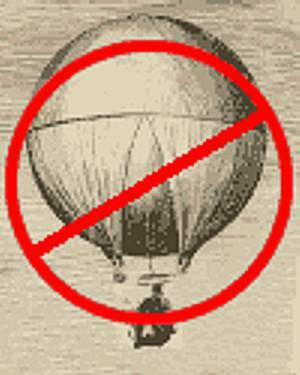 According to a summary list of patent titles published in 1812 in the book The Emporium of Arts and Sciences, by John Redman Coxe (p.392), a U.S. patent was issued to Moses McFarland on 28 October 1799 on a “Federal Balloon.” More information on the patent is impossible to obtain from the U.S. Patent Office because the original copies of patents were lost when the building in which they were stored burned to the ground in 1836. Only a few of those patents were ever restored. Some sources, including books and web sites, state that this represents the first aeronautical patent issued in the U.S., which is probably only assumed from the patent title of “Federal Balloon.” However, this is apparently a false assumption, as can be found in correspondance in 1799, held by the Massachusetts Historical Society. The letter to McFarland of 5 October 1799 is largely illegible, although the gist seems to be Pickering simply suggesting a name change for the “machine”. So, without being entirely certain one way or the other, I send along the information and you may do with it what you will. Please let me know if I can help further. The fourth edition of Famous First Facts by Joseph Nathan Kane is one of the books that has referred to McFarland's patent as a “first.” Confirmation has been received by email from the publisher that the sixth edition has dropped this reference. Today in Science History - description with other events for 28 October.